JQ Talks: Dress Shirts for Men by Wayne Lowe! CNY is around the corner and if you are looking for some last minute shopping, here's something for you because nothing is easier than to sit in front of your computer and start clicking. 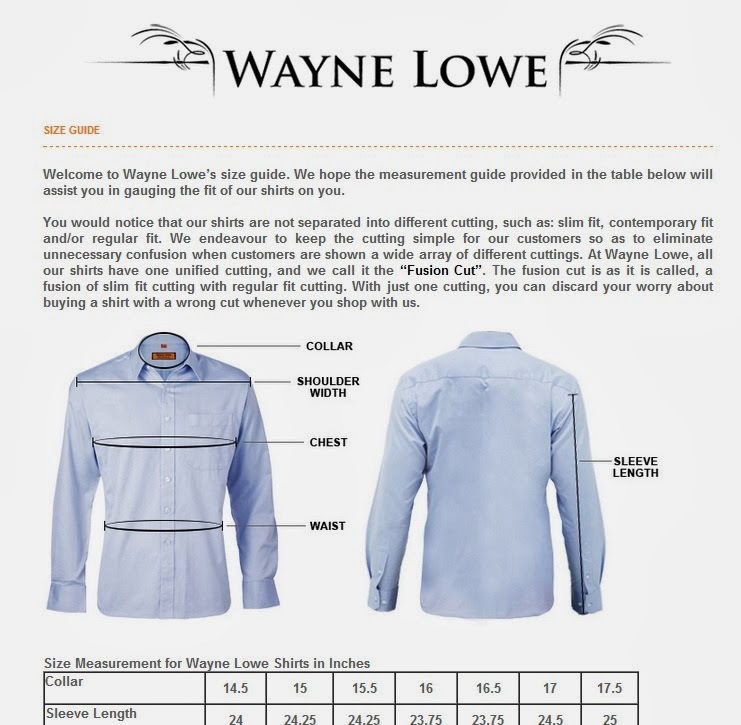 Wayne Lowe is an online retailer for men's dress shirt. The team consist of a group of everyday people coming from different corporate backgrounds that faces one similar problem, Malaysian heat. They realised that most mass market dress shirts are rather uncomfortable to wear due to the hot and humid weather we encounter daily. And as we get toasted under the blazing sun, the feeling of lesser quality fabric get "glued"onto the skin feels repulsive at times. The mass market shirts are made out of polyester, Chief Value Cotton (a combination of polyester and cotton as its main component, aka. CVC), and even lesser quality cotton just don't cut it for guys whom are required to wear smartly for work yet needed to run around under the hot sun. Thus, they started tp search for shirts that will feel cooler, more breathable and more comfortable to wear even under our hot climate. This led them to produce shirt made from quality 2-ply cotton fabric! Ply is how many yarns are twisted together to make a single thread. Completely different that the 2-ply toilet paper, 2-ply means that two yarns are twisted together to make a single thread that is then woven into the fabric. They are generally superior to single-ply fabrics because they lend a smoother, more crisp hand feel. With 2-ply being more expensive, Wayne Lowe's team mission is to work on an alternative to deliver quality dress shirts that is value of money. As a result, with much research and attention given, they came up with high quality dress shirts that are 100% cotton, 2-ply, high thread count and high yarn number, all at a price below the current market rate. Each shirt comes in a presentable box that is great to skip the gift wrapping mess. In the box, the shirt is nicely covered in white paper tissue along with a care instructions card. Sizing is no issue because they've prepared you a sizing guide for your convenience, click here. Of course, being a girl whose boyfriend refuses to give me one of his shirts (with the excuse of him not owning many shirts), I got myself one "boyfriend shirt" of my own! I pair it with a simple black tube inside and a faded leather pants. Hook on a clutch belt, heels and tons of hand accessories and you're ready to go! Their material are extremely comfortable and high quality yet light at the same time. Even the collars are amazing, it stays in shape even after much bending. The best part I would say is that the people from Wayne Lowe are extremely nice. They would take the hassle to meet me at my preferred location just to pass me some sample shirts for my brother's to try before getting the chosen ones. Super friendly. At the moment, they have limited supplies of shirts and they are having a promotion of buy 1 get the second at 50% off! Valid till 31st January 2014. Also, you now have the options of Cash on Delivery! Pay only when you're satisfied with their shirts delivered to your doorstep. Looks like a good new place to shop. Quality material is something that is lacking in men's shirts today. They often favour brilliant designs but compromise on the quality of the materials. Looks tempting! & with online purchase as an option, it totally simplifies everything.